In that bottom pic I'm wearing Golden Fawn (and only Golden Fawn) underneath the eye (and shadows from the Urban Decay Naked palette with YSL's Effet Faux Cils eyeliner pen on top). Avon's Supershock gel liners are the bomb: they glide on smoothly, offer intense colour and last all day. The black version is one of my all-time favourites, and this new shade joins it in the Eyeliner Hall Of Fame. It's a stunning metallic pewter that's part of the brand's pretty spring collection, Smoke & Mirrors, out in February. I'm loving it under the eye as a much softer alternative to black - like in the picture above - and it's beautiful as an inner-corner highlight, too. I also think it would be gorgeous all over the lid as a base for a neutral shadow look. For €8, this is a lovely little gem of a liner that has a place in any makeup bag. It'll always have a home in mine. Avon don’t sell through shops but exclusively through independent sales representatives – find yours here. 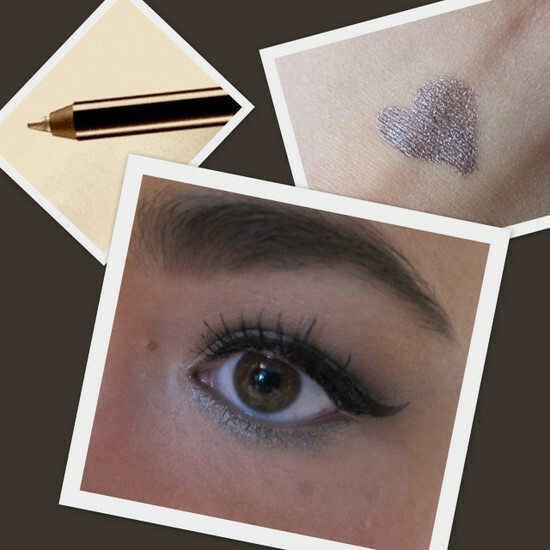 Love the shade, the little heart you drew is so cute, your already gearing up for Valentines Day! Cuuuuuuuuute post and amazing blog! OOOOH - This looks lovely and easy to use too - Bonus! how pretty. i'm going to have to pick some of this up perhaps. This is gorgeous! Can you get MARK in Ireland? It's another line from Avon that is catered to a younger crowd in the US. I'll have to check out this colour and see if we can get it in the US. Have never tried any Avon products... love your Eye make up! The colors really bring out your pretty eyes! Oh my goodness, I love this!!! I've never tried anything Avon, but this looks like an amazing product. Very pretty and definitely a perfect alternative to black. YSL Le Teint Touche Eclat Foundation Review - Five Reasons To Get In Line!